I recently came across this review I had written before I had a blog. I honestly forgot that I had read and written about this book. But someone recently liked the review on Goodreads and so I clicked on the link and suddenly it all came back to me. And I started to cry. You see, just this past October, I purchased a brand new shiny black baby grand piano. I've always wanted one since I was a little girl. I played piano for 13 years. Until I was a sophomore in college when I mistakenly thought I wanted music to be my major. But a semester and a half of too much competitiveness in the music program and not enough joy, in addition to a professor who broke my spirit, and I pretty much stopped playing the piano regularly after that. But last year a lot of things started coming back from my past, reminding me of the joy I once felt when I played the piano brought me to a moment of clarity when I realized that I want to start playing again, but this time only for myself. I don't care if I master a difficult piece of classical music to the perfection of a concert pianist. Just to be able to glide my fingers across the keyboard again, somewhat competently, is satisfaction enough for me. 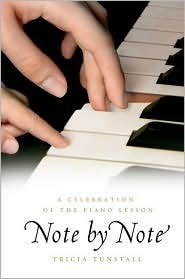 And so I present to you, my review I wrote in 2008 that still holds true today of Note By Note: A Celebration of the Piano Lesson by Patricia Tunstall. This book brought back so many wonderful memories of my 13 years of piano lessons. There were so many passages that moved me to tears because I remember having an intimate relationship with the pieces Tunstall described herself and her students playing. As I was reading this book, all that overcame me was how much I missed playing the piano and also how I would've loved to have a teacher like Tunstall. I had a wonderful relationship with my piano teacher and I would never want to give up my time with her, but as I was reading about Tunstall's teaching methods, part of me feels like I might've been able learn how to play by ear if she had been my teacher and maybe I would've been able to understand the workings and theory of music a little better. My understanding of music theory is extremely dismal and it was never something I could master - even when I was a music student in college (which lasted a whole semester and a half). The reason I gave this book 4 stars instead of 5 is because this book is definitely not for everyone. If you never had a desire to play the piano or any sort of instrument when you were younger, this book probably won't change your mind. It is written more for classical music and piano-lovers. I also wouldn't recommend this book to people who don't have any sort of understanding of how music works. The terminology Tunstall uses in this book can only be followed and understood by people who have some sort of musical background. Having said that, I really feel like this book might be the catalyst that gets me to sit down at the piano again. The following passages from the book were so memorable to me, that they made me ache for those ebony and ivory keys again. My hands were not yet big enough for Rachmaninoff, but for Madame Dmitrieff, Rachmaninoff was a matter of heart. "Play deep!" she admonished as I worked my way through the splayed chords of the C-sharp Minor Prelude. "Imagine the piano keys are a foot deep... go deep down, all the way down!" And when I came to the middle section, with its fierce chromatic melody and turbulent arpeggios: "More feeling! More feeling! More feeling! You are playing gloom, okay, but you must play despair, you must play anguish!"... I tried my twelve-year-old best to play anguish and despair. Mostly I was trying to get the notes right, but I can remember that as I played, the phrase "the Russian soul" came into my mind, and I thought I understood it. When I was in high school, I too, attempted to master Rachmaninoff's Prelude in C-Sharp Minor. It was one of the most dark and anguishing pieces I've ever played - but an emotional, passionate person such as myself needed that sort of release when I sat down at the piano. I eventually did master this piece and went on to perform it at competition to a second place finish. I have never been naturally gifted at the piano. My hands are small (my wedding ring is a size 4. Most people can't even fit it on their pinky!) and I don't have especially long fingers. So attempting a Rachmaninoff piece with huge chords, some bigger than an octave, was quite the undertaking, which I was extremely proud of myself when I actually did master this piece. Reading this passage about the author's own experience playing this piece, and having a Russian teacher no less, really brought back all those memories of when I learned to master this piece. Today if I sit down to the piano I can play the first section quite well, but once I get to the agitato section, I completely lose all my ease and facility at the piano. Undeniably, pop music can be seductive. But I have never seen its appeal turn a child against classical music. I think of Haley, the teenager who succumbed to the spell of the Schubert Impromptu. 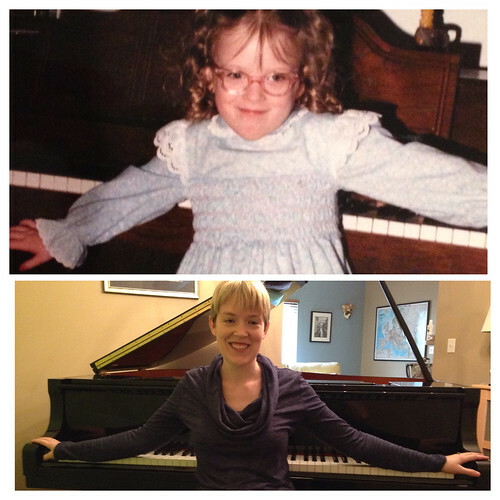 Haley had come to me initially at the age of fourteen, having left a teacher who had rigorously schooled her in piano classics for a number of years. "I hear you let kids play fun stuff sometimes," she said to me at our first lesson. I let her play some fun stuff: Broadway show-stoppers, hip-hop riffs, contemporary pop. She played all this music with gusto; she was clearly having fun. And after about a year she come to a lesson with her old collection of piano classics sandwiched between "All That Jazz" and "Accidentally in Love." We started the Chopin Waltz in A Minor, the one with the bleak and lovely melody in the left hand, and after a few more weeks I did not see "All that Jazz" again. Broadway may be alluring; Chopin is, in the end, irresistible. Chopin is indeed irresistible. He was and continues to this day to be the classical composer I am most smitten with. Probably because he composed exclusively for the piano and that's where his heart and soul was devoted - much like myself when I was younger. I'll never forget the first time I heard Chopin's Fantasie Impromptu when I was ten years old. There will never be a piece that stirs my emotions more than that one. I never learned how to play that piece and I think a goal I have before I die is to be able to master that piece. The music does not come easily to her, and she struggles with many passages, but she doesn't tire of it. For her it is not a piece to master so much as a place to dwell. While mastery was always my goal in practicing a piece of music, this passage really does ring true for my own experience of playing the piano. I was dwelling there. I had a designated piece to play for whatever mood I was in at the time. If I was angry or frustrated, I broke out the Rachmaninoff prelude; if I was in a nostalgic, dream-like mood, Chopin was my composer of choice. Excited and content: Mozart or Beethoven. And finally, on pp. 128-130, Tunstall describes an experience teaching a rather determined, yet musically awkward student Beethoven's Sonata Pathetique. Her description of this teaching experience brought back my own memories of learning this sonata. It is, to this day, my favorite Beethoven sonata because all three movements, indeed, move me. This book speaks to so many different people, but ultimately you have to be a lover of classical music to enjoy it. I don't think Tunstall is going to be converting anyone with this book. You have to come into it already loving it. I've never seen a book celebrating piano lessons before! I'm going to try to find this one, because, like you, I've neglected the piano for far too long. It would be nice to be inspired to take it up again. Hope you're enjoying your baby grand!